Shreem Structure division is engaged in designing of manufacturing galvanized steel structures, began its operation in the year of 2000. Enriched by our vast industrial experience in this business, we are involved in offering an enormous quality range of Galvanized Steel Structure. We are offering Galvanized Structure to our client and our product is made of good quality. We provide an array of galvanized steel structures to our valuable customers. These hot dipped galvanized steel structure are made from high grade steel that are made from superior quality steel. This is galvanized or painted to give them longer endurance. 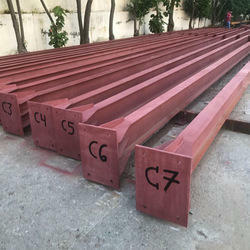 Our steel structures are widely used for various industrial purposes. We also provide galvanized steel cabinets and enclosures.